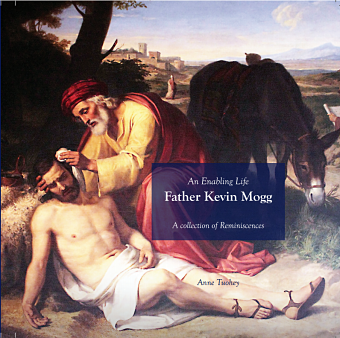 An enabling life: Father Kevin Mogg. A collection of reminiscences by Anne Tuohey. In An Enabling Life: Father Kevin Mogg. A Collection of Reminiscences, Anne Tuohey and several contributors have captured key aspects of the history of the Catholic Church as it struggled to cope with the huge migrant flows after the Second World War and then embrace the new directions set by the Second Vatican Council. The book traces these periods of social and cultural change though Kevin’s eyes, focusing on significant periods and events in his life from the 1950s. The book’s cover depicting the Good Samaritan is the first hint that good deeds abound within. Melbourne Diocesan priest Kevin Mogg, now in his mid-eighties, continues to be one of the good guys in a time when a dark shadow has been cast over the Catholic Church. Able to operate on many stages, often simultaneously, Kevin has been a much loved, pastoral shepherd of three parishes, a chaplain, member of several boards and for 25 years, Episcopal Vicar for Social Welfare. In this latter role, in 1980 he founded Catholic Social Services Victoria, the overarching body that brings together a range of Catholic welfare services whose mission is to support the poor and disadvantaged. The book recounts how this agency has provided strong advocacy on many social policy issues. In turbulent times such as the Kennett years of funding cuts, Catholic Social Services under Kevin’s steady and energetic leadership provided safe haven for many small grassroots agencies at peril of being shut down. Kevin also undertook studies in criminology and psychology to better equip him for contemporary issues, and he traveled extensively seeking to understand what other countries were doing about how best to address social problems, and learn which could potentially be applied in Victoria. While the book has many poignant moments, it does not shy away from controversy. It exposes examples of the Church stymied by an inability to adapt or, to at the very least, keep the door open to the possibility of change. The chapter on the Church’s Drugs Task Force is a clear example of a lost opportunity effectively to tackle the scourge of drugs that continue to bedevil our community. Kevin’s vocation to be a priest was strong from the outset and motivated him to use his talents for the benefit of many communities. In the 1950s, Kevin attended the now closed Werribee Seminary and received the conventional, strict and rather monastic induction which is now widely recognised as ineffective in preparing priests for the challenges of Australia for the mid-20th century. Yet he somehow blossomed in this environment and later became Rector of the Clayton Corpus Christi Seminary. Described by seminarians as a breath of fresh air, he challenged the orthodoxy he was trained under, setting about preparing young men – and women – to better respond to a post-Vatican II world. From his first parish appointment as Curate at West Heidelberg’s St Pius X parish, he was energetic and focused on engaging with the parish community. Using sport as an invitation to become involved, he gathered the youth and families around the parish, enacting the approach of the Young Christian Workers. He would implement this approach at North Ringwood’s Holy Spirit parish and even in his seventies as parish priest at St McCartan’s Mornington, continued to build a strong sense of community engagement and connection. There are hundreds of men now in their sixties and seventies who credit Kevin with setting their lives on good paths, and these include young men he encountered as a youth justice chaplain in the 1960s-1970s. He continued to visit men in adult prisons for many decades. Kevin has always been someone keenly interested in all people, with a gift for friendship which has helped him survive the turbulent periods of a church struggling to adapt in changing times. Kevin indeed has the ability to walk with kings but never lose the common touch. The book bears witness to the positive role of priests as faith-based, community leaders while at the same time acknowledging the crisis in the Church due to the fallout over systemic child abuse. In unpacking key events in both Kevin’s priestly life and in the life of the Church and society, the book considers the challenges of keeping an open mind, motivated by a genuine desire to improve the lot of the poor and forgotten but often constrained by the Church hierarchy and unswerving loyalty to one’s bishop. These six decades were indeed interesting times and Kevin is acknowledged as one who took up the mantle to ensure those on the margins were not forgotten. An Enabling Life can be ordered for $25 through CatholicCare. It was launched by Judge Michael McInerney on 31 January at the Knox Centre, East Melbourne. An Enabling Life is a project of the Yarra Institute for Religion & Social Policy in association with Social Policy Connections.